This web page was created July 8, 1997 for the birthday of my mother, Jean Davidsmeyer (nee Yost). Both her parents are gone, but their legacy of love and charity continues, especially within the hearts of their two children, Jean and Norman, and their grandchildren. My memories of times spent with my grandparents are precious to me. This web page was created so that I could share a bit of them and a bit of the flavor of their lives with others. Johanna Balsma Yost was the daughter of immigrants from the Netherlands. Paul Balsma (originally Bylsma) and Anna Kroll married in Holland on March 17, 1888, the day before setting sail for the United States. Neither spoke a word of English at the time. She was an orphan who had worked as a domestic in Holland; he was unable to find work in the Netherlands and came to the new world seeking opportunity. In America, the Balsmas settled in Lafayette, Indiana. Paul found work making ice cream. Eventually, they changed the family name from Bylsma to Balsma, because Paul did not like how Americans mispronounced it. Once he learned English, he refused again to speak another word of his native language. My grandmother told me, he did so because he would say, "In Holland there was no work. A man couldn't feed himself or raise a family. Here there is work. Here I had my family. This is my home. I won't speak Holland any more." The Balsmas raised six children. 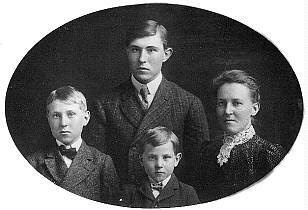 The fourth child was named Johanna, but she preferred to be called Jo. This was my maternal grandmother, for whom I am named. Jo worked as a stenographer for the Paragon Cooperage company of Fort Wayne, Indiana before becoming a full-time wife and mother. I agree with the sentiment about her that was printed in a 1919 article that announced her wedding: "Miss Balsma is a young lady of winsome nature and extremely pleasing personality, a great favorite with her many friends." Throughout her life, she always had a twinkle in her eye and an easy laugh. She was a woman who loved life, loved God, and loved her family. She brought her joy and zest for living to all her activities and to a long list of volunteer efforts. She donated her time to the hospital, to the church, to PEO, and to her friends, who were many. 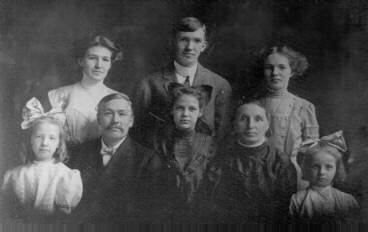 Helen Balsma February 9, 1902 Lafayette, Indiana ?? Annette Balsma December 12, 1902 Lafayette, Indiana ?? In 1919, Johanna married Verne Yost who had just been discharged from the service after serving in France during the war. He returned home to marry his "little Dutch girl." 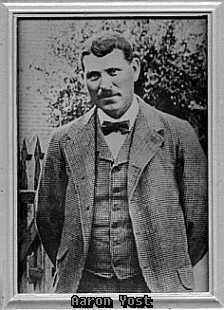 Verne Yost was the second son of a farmer and was raised on a small farm near Lafayette, Indiana. He is descended from an Aaron Yost of Germany, who first came to this country as an indentured servant in the 1600s. Verne's father, Aaron Yost, died when Verne was only eight years old, leaving his twenty-three-year-old widow alone with three children. Rena Warwick was a remarkable woman who raised three young boys to become responsible, honest, hard-working men. She sent all three of her sons to college (Purdue University) and lived to see them raise families of their own. In 1982, Verne wrote his recollections of life growing up on the Indiana farm in the first years of the 20th century. The words are as simple, straight-forward, and honest as the man who wrote them. Verne graduated from Purdue in 1916 as an electrical engineer. He served eighteen months overseas in the U.S. Army with the 56th engineers. He worked for the C. and N.W. in Chicago before going to work for Western Electric. Verne was a noted practical joker who delighted in doing the unexpected. He could pull the most outrageous prank with a perfectly straight face. Verne worked as an engineer for Western Electric until his retirement in the 1960s. He and Jo moved to Eustis, Florida. They were active in the church there for decades and Jo formed a Florida chapter of PEO, a charitable organization. Verne continued enjoying fishing in the lakes and streams of Florida. 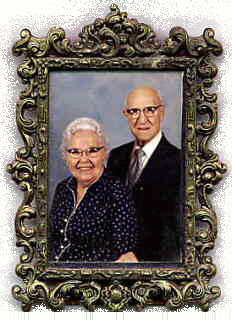 They lived and loved together as man and wife for sixty-six years. Verne Yost died November, 1985 in Eustis, Florida. He was 91 years old. Joanna Balsma Yost passed away in Altoona, Florida May 12, 1989. She was 92 years old.